NEC Display Solutions Europe GmbH has its European headquarters in Munich, Germany and is responsible for all business activities in EMEA. 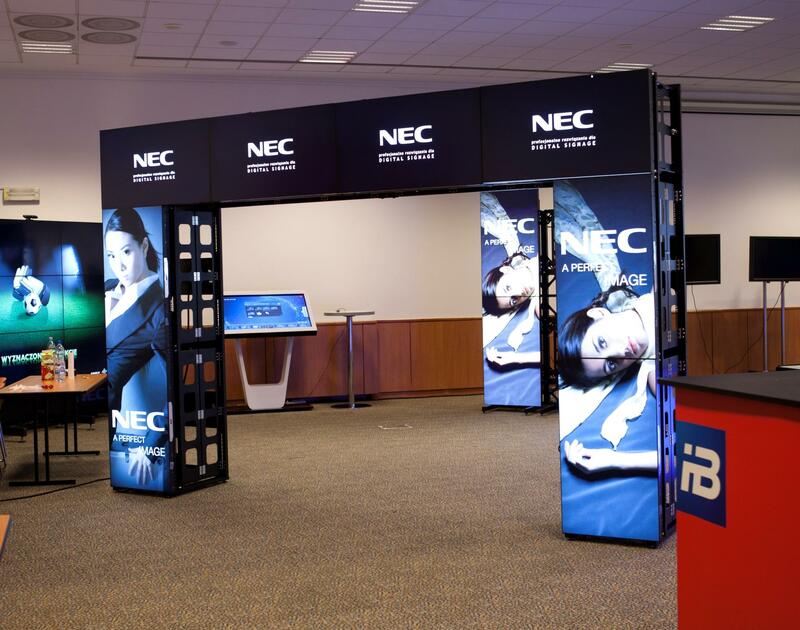 NEC Display Solutions benefits from the technological know-how and technologies of the NEC Corporation and, with its own Research and Development, is one of the world's leading manufacturers offering the widest product range of display solutions in the market. The display product portfolio ranges from entry-level to professional and speciality desktop LCDs, via large-size Public Displays for Digital and Retail Signage. The Projector range offers products for all needs, from portable devices via business projectors to products for permanent operation (such as PoS applications) and digital cinema projectors. SQM has been building its position as a leading provider of Digital Signage solutions and services in Poland and Central and Eastern Europe for almost 15 years. The company specializes in comprehensive implementations primarily for retail and corporate communication. SQM conducts unique on the Polish market business model based on building services in accordance with the idea and omnichannel strategies. SQM also cooperates with clients in creating marketing strategies and choosing solutions and production of multimedia content. In 2015, the company became the exclusive distributor of SCALA products for the Central and Eastern Europe market. SQM is a multiple laureate of the PDSA Awards for reference installations and introduction of innovative software products. The key SQM customers are: Posnania Center, Veolia Group, PZU Group, Clear Channel Polska, Oriflame, Imperial Tobacco, R-GOL, ADBL, Extral and Merck. Since 2013, the company has been active in international projects in entire Europe. BE Media Advertising Agency specializes in services and execution of advertising campaigns on outdoor advertising media, in particular on digital media. BE Media offers several thousand of advertising media available to customers. Due to the fragmented market, the Agency made an successful attempt to consolidate and educate on the market of digital outdoor advertising media. A wide array of provided services can be described as "Media Atelier". The agency consists of a team of specialists at whose cooperation allows for providing comprehensive advertising campaigns. Its scope includes both the planning and the creation process. The Agency's extensive experience, supported by excellent knowledge and practice, means that each customer is individually supported in terms of their needs. Therefore, cooperation with clients is usually based on long-term relationships. PDSA (Polish Digital Signage Association), founded in 2008 as an independent platform for companies and people interested in developing the Polish DS market. PDSA remains the key leader in DS market education and the main source of knowledge about the Polish DS market. It gathers companies operating in the sector of digital information and advertising, who care about the development of the industry in Poland, exchange of experience and development of consistent standards. Cooperates with foreign DS associations. Since 2009, he has been actively supporting Digital Signage Trends conferences and rewarding best practices, innovations, content and DS case studies. Organizer of nationwide conferences and industry trainings as well as external events. Despite its short history, the company can boast of cooperation with prominent speakers at international level, experts, trainers and representatives of state authorities. The Flow Effect team consists of people who perfectly understand the mission of the company and believe that relationships are built most effectively by meeting the others in person. That is why they create an opportunity to establish business contacts and acquire practical knowledge from the best. Pursuing the successive development of Flow Effect is based first of all on creative thinking, very good organization and understanding of the client's needs. Several years of experience is a guarantee of quality of services and comprehensive planning of events. R-GOL.com is the result of dreams. It arose in the head of a young boy who, thanks to his father from an early age felt the atmosphere of the football locker room. However, he did not live to become a professional footballer. When dreams of a career were lost, he took up business in the football industry. It all started with a few pairs of shoes in a bag and selling to colleagues from the locker room. Thanks to determination and persistence, a beautiful dream began, which no one expected then. Currently, R-GOL.com is the largest football shop in Poland. It has 4 brick-and-mortar stores: in Ostróda, Olsztyn and Gdańsk, and the most impressive store of its kind in this part of Europe: in Warsaw at Puławska 255. Studio MUSU provides comprehensive services in design and implementation of commercial and public interiors. We create spaces for Consumers, Employees, Investors. We create unique concepts of shops for our clients and implement network projects. We care about image consistency with the philosophy, the idea of the brand, the company, the place. We offer a comprehensive range of design services in interior design, architecture project, technical industries, supervision, projects and delivery of equipment and implementation. We treat each project individually and with the utmost care. We offer the highest quality of design services with particular attention to optimizing the space arrangement, rationalization of costs and schedule.